The road to Dota 2‘s The International 8 has been a treacherous one for each team involved. However, the dust has finally settled after over a week of intense competition. In a dramatic grand finals, one team has claimed the first place trophy, the Aegis of Champions, and that team is none other than OG, who beat PSG.LGD 3-2. OG winning this year’s International is a massive deal for multiple reasons. For starters, since the very first TI, the order of TI winners has been the same: odd years go to Western teams, and even years go to Chinese teams. This narrative of TI grand finals has been unbroken up until now. While OG played a Chinese team in the grand finals, and it seemed like China would continue this trend, OG pulled out all the stops to completely flip that narrative on its head. More importantly, this win is significant because the OG squad was formed just a month before the qualifiers for The International, and as a result, they were one of the least favorited teams to make it far into the tournament, let alone take the entire thing. OG formed its current roster out of the ashes from longtime friend and player of OG, Fly, as well as S4, an immaculate mid player, and Resolut1on. The leave of these three players were sudden, and as such, OG had to use their coach, Ceb, relatively unknown player, Topson, and inactive player ana, in order to fill up their roster in order to continue participating in the tournament. Going in to the phases leading up to The International 8, OG had to qualify for the main qualifiers, and then through those qualifiers, officially qualify for a spot in the group stages. Once the team had gotten to this point, many dismissed this performance, as all of the European powerhouses were already invited to The International 8. As the group stages went on, however, they found themselves in the top 4 of their group, netting them a spot in the upper bracket. However, many fans were awestruck by their performance in the upper bracket. OG took on significant challenger, VGJ.Storm, and beat them 2-0. Next up, the team took on EG, the team that housed previous teammates Fly and S4. In an emotional match, OG pulled off an impressive comeback, defeating EG in game 3 and saving themselves from getting knocked into the lower bracket. 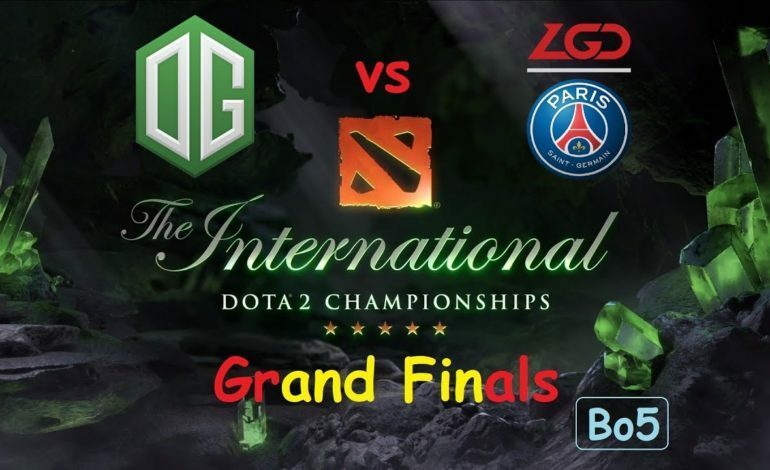 Next up, OG had to face the strongest, and only remaining Chinese team, in the tournament, PSG.LGD. While each team went back and forth, game 3 was, once again, another impressive display from OG. Despite being behind for a significant portion of the game, the team worked together perfectly to dramatically turn the tide. The team was quite literally one minor misplay away from losing when LGD were attacking their ancient. With LGD tasting victory, the team made a long, final push to attempt to end the game by destroying OG’s ancient, but with immaculate plays all around, especially from JerAx, OG thwarted the Chinese team’s advances, and managed to put LGD into a bad place after almost losing. In a rush to end the game with the window of opportunity granted to them, they barreled down mid to immediately start destroying LGD’s ancient, and although LGD fought until the bitter end, it proved too much, and OG made their way to the grand finals off of that win. In the grand finals, however, LGD made it back for a rematch after defeating EG 2-0. Game one of the series went to the way of OG, and it was a clean game at that, with OG taking strong command of that game. However, problems arised game 2, with LGD dominating the rag-tag gang of OG. Much of the same happened in game 3, with LGD not giving OG a chance to make one of their legendary comebacks that they had been pulling off all tournament. Game 4 was looking to be much of the same, with LGD poised to take home the Aegis with a significant objective, gold, and exp advantage. Things quite literally looked long over at the 46 minute mark, but for the next 19 minute, however, OG had other plans, and slowly but surely, clawed their way back from a game almost everyone considered lost. Once again, the entire team worked in perfect unison, and forced a game 5, a feat that has not happened at a TI event in half a decade. During game 5, once again, the game seemed to be going the way of LGD, with a decent gold and exp going their way. At one point, LGD had 22 kills up against OG’s 6, but once again, almost like in a fairy tale, OG eventually got into a position where they team wiped LGD, keeping their hopes of winning alive. Once that happened, things began to slowly snowball into OG’s favor, with teamfight after teamfight ending in favor of OG. Smelling blood in the water, OG made their push, and after what seemed like an eternity, LGD were eventually pushed into checkmate, and OG, against literally all odds, won the entire tournament. In addition to this impressive win, Topson, their mid player, ended up winning his first ever LAN event, as well as the biggest tournament in the world. He went from trying to break into the professional Dota 2 scene with only a couple years of professional play under his belt, and winning just a little over $3,000, to winning over $2 million by joining a team in shambles on short notice. This win has cemented Topson not only as one of the best players in the world, but also as having one of the most, if not the most, impressive and amazing underdog stories in Dota 2‘s entire history.